to be sold at tomorrow's hoolaulea. 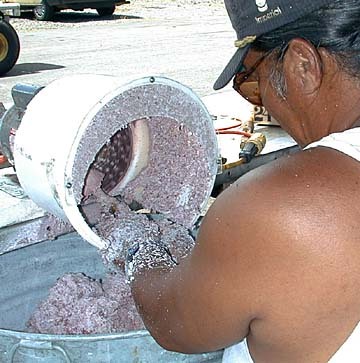 KALAPANA, Hawaii >> When ancient Hawaiians made kulolo candy, they didn't have the use of washing machine motors, cooking oil canisters or a certified imu. But despite modern adaptations, the taste of kulolo candy probably has not changed in a thousand years. Visitors can judge the taste of kulolo for themselves tomorrow at a Kalapana Ohana Association hoolaulea, a fund-raising festival from 9 a.m. to 4 p.m. at the former Kalapana Star of the Sea "painted" church. Earnings will go for the restoration of the building, which was moved out of the path of oncoming lava in 1990 and now sits by the side of Highway 130 about a mile from Kalapana. The hoolaulea will feature a procession of the Aloha Week court and entertainment throughout the day. But for those with a sweet tooth, the draw will be kulolo. For anyone not familiar with this Hawaiian candy, description requires some effort. The Hawaiian dictionary calls it "pudding," which suggests something runny. Actually, the final product is cut into squares like fudge, has a chewy lumpiness like tapioca, and tastes something like caramel. University of Hawaii-Hilo Hawaiian-language professor Kalena Silva says making kulolo goes back to ancient times. When Kalapana Ohana members Larry Kuamoo, Thompson Quihano and Alex Harris gathered at Mabel Wilson's house in Paradise Park subdivision this week to prepare the ingredients, they used tools not available to the ancients: motors from old washing machines. The spinning shafts of the motors are attached to homemade rasps that grind the white meat out of coconuts and reduce hard taro roots to a pile of pulp. Taro is the main ingredient. The coconut meat is squeezed to obtain its "milk." And sugar and honey give a sweet taste. Kalapana matriarch Emma Kauhi remembers her youth when Uncle Kaipo Kaawaloa would collect wild honey by cutting honeycomb from a hive with one hand while holding bees at bay with the other hand, using a bamboo, burlap and kerosene torch. Kulolo was made in those days for special occasions such as birthdays and weddings, she said. 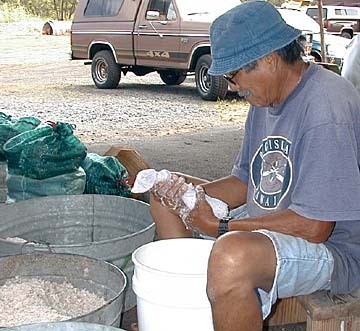 With no handy washing machine motors, the many hands of Kalapana people joined to scrape and grind the coconuts and taro, she said. This week, Ohana members cooked the kulolo in ti leaf-lined cooking oil cans. In Kauhi's youth they used cracker cans, she said. Kulolo also used to be cooked overnight in an imu, a hot-rock, leaf-covered oven dug in the ground. But now state health rules require commercial kulolo to be cooked in a certified facility. In applying that requirement to an imu, officials decided to certify it if it was in a pile of earth above ground level, said Ohana member Noelani Ng.